For developing energy-efficient buildings, the Advanced Energy Design Guide for Small Office Buildings provides a sensible approach by including practical products and readily-available, "off-the-shelf" technology. The Guide offers you all the tools you need to create an energy-efficient building where the owners will see a 30 percent energy savings compared to buildings that only meet the minimum requirements of Standard 90.1. This four-color guide presents a simple approach to energy design for contractors and designers of office buildings up to 20,000 sq. ft. Ideal for the Contracting, Design and Remodeling industries, this peer-reviewed Guide features a user-friendly format and contains "how-to" guidance. The Guide provides benefits and savings for building owners while maintaining quality and functionality of the office space. This Guide was awarded a 2005 Leadership Award by the USGBC, an honorable mention by the Alliance to Save Energy, and a Best Sustainable Practice Award from the Sustainable Buildings Industry Council. This Guide helps meet all of the owner's energy performance requirements, since it was developed by a diverse group of energy professionals: ASHRAE, the American Institute of Architects (AIA), New Buildings Institute (NBI), the Illuminating Engineering Society of North America (IESNA), and the U.S. Department of Energy (DOE). This document contains recommendations and is not a minimum code or standard. It is intended to be used in addition to the existing codes and standards and is not intended to circumvent them. 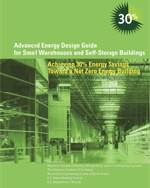 Read the March 2005 ASHRAE Journal article on The Advanced Energy Design Guide for Small Office Buildings. Read about the USGBC Leadership Award. Read about the award from the Alliance to Save Energy. Read about the Best Sustainable Practice Award from the Sustainable Buildings Industry Council. View a recorded seminar presentation about the Guide by ASHRAE Presidential Member Donald G. Colliver. The presentation, Overview of ASHRAE's Advanced Energy Design Guidance Series, was part of the technical program at the ASHRAE 2005 Winter Meeting in Orlando, FL. 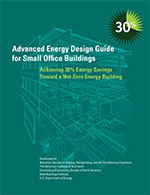 To promote building energy efficiency, ASHRAE and its partners are making the Advanced Energy Design Guides series-including Advanced Energy Design Guide For Small Office Buildings-available for free at ashrae.org/aedg.